García is the large man sitting in front of the flag. 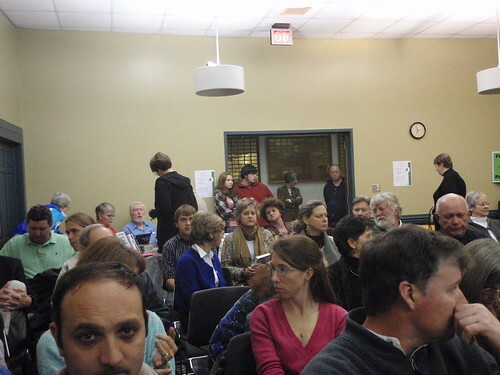 The Monsanto rep. is the short man sitting to García's left. 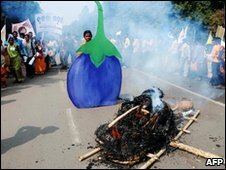 I hope those opposed to Bt brinjal don't think that's the end of the story; it will be back. But at least for now they've won. By the late ’80s, the chemicals had started taking a toll. Mr. Govindan’s land dried up. Yields declined. Mr. Govindan said the quality of his crops did, too. In the old days, he told me, if you cooked too much rice for dinner you could keep it overnight and eat it the next day for breakfast. Now, rice from the fields around Molasur turned rotten overnight. Other things had changed: labor was more expensive, the price of fertilizers and seeds had increased, and the overall cost of living had outstripped the rise in crop prices. The scientist M.S. Swaminathan, often referred to as the father of India’s green revolution, has spoken of a “disaster” in Indian agriculture. The sociologist Dipankar Gupta has written of “hollowed” villages. According to a recent report in The Hindu newspaper, almost 200,000 farmers committed suicide between 1997 and 2009 — a national tragedy (although it is rarely treated as such) brought on by rising debt and the resulting economic and existential despair. So is the Indian government being realistic about the problem? Well, if India follows the U.S. model, the food will come from a tiny number of agrobusinesses that will end up owning most of the land. Janisse Ray plans to speak in Moultrie and sign books. The Georgia Center for the Book, with the support of the Georgia Humanities Council, is working with the Moultrie-Colquitt County Library System and the Moultrie Chapter of the Georgia Conservancy to present a free public lecture and book-signing by Ray on Tuesday, Jan. 26, at 7 p.m., in the library auditorium. Ray was born in Baxley, Ga., and is an environmentalist activist, poet, a memoirist and the award-winning author of “Ecology of a Cracker Childhood.” This book, a memoir about growing up on a junkyard in the ruined longleaf pine ecosystem of the Southeast, was published by Milkweed Editions in 1999. Ray has won a Southeastern Booksellers Award 1999, an American Book Award 2000, the Southern Environmental Law Center 2000 Award for Outstanding Writing, and a Southern Book Critics Circle Award 2000. “Ecology of a Cracker Childhood” was a New York Times Notable Book and was chosen as the Book All Georgians Should Read. As an organizer and activist, she works to create sustainable communities, local food systems, a stable global climate, intact ecosystems, clean rivers, life-enhancing economies, and participatory democracy. She is a founding board member of Altamaha Riverkeeper and is on the board of the Environmental Leadership Center of Warren Wilson College and Satilla Riverkeeper. Are you tired of development trumps all? Do you like trees and home-grown vegetables? Come hear Janisse Ray! For a couple of years, the Institute for Responsible Technology has predicted that the US would soon experience a tipping point of consumer rejection against genetically modified foods; a change we’re all helping to bring about. Now a December article in Supermarket News supports both our prediction and the role the Institute is playing. “The coming year promises to bring about a greater, more pervasive awarenes” of the genetically modified organisms (GMOs) in our food supply, wrote Group Editor Robert Vosburgh, in a trade publication that conventional food executives and retailers use as a primary source of news and trends in the industry. Vosburgh describes how previous food “culprits” like fat and carbs “can even define the decade in which they were topical,” and suggests that GMOs may finally burst through into the public awareness and join their ranks. As an example of things in the plan that could use fixing, it proposes to reclassify Quarterman Road from local to minor collector on the basis that within 20 years it might have enough traffic "if it were developed", despite the Greater Lowndes 2030 Comprehensive Plan showing the same neighborhood as agricultural through 2030. 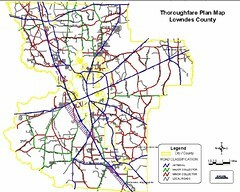 Many other roads are proposed to be reclassified by the new Thoroughfare Plan even though they do not meet the criteria set forth in the same plan itself. The plan might benefit from some additional process or procedural input and review. Fortunately, the Chairman and the County Manager appear to be soliciting input. More details here. 1. Issue 2 seeks to stop animal welfare improvements. Agribusiness interests are trying to change the Ohio constitution so they can continue cruel and inhumane practices on factory farms—confining animals in tiny cages and crates so small they can’t even turn around. Issue 2 proposes an industry-dominated power grab to protect the status quo: hens crammed into cages so tightly they can’t even spread their wings, breeding pigs confined in tiny barren crates and calves chained by their necks inside veal crates. We wouldn’t force our pets to live in filthy, cramped cages for their whole lives, and we shouldn’t force farm animals to either. All animals, including those raised for food, deserve humane treatment. 2. Issue 2 threatens our food safety and health. Factory farmers have put our health at risk by recklessly telling us that it’s okay to keep animals in overcrowded, inhumane conditions. Cramming tens of thousands of animals into tiny cages fosters the spread of animal diseases that may affect people. For example, the American Journal of Epidemiology reported that people who eat eggs from hens confined in cages are 250% more likely to contract Salmonella. The extreme confinement of animals is also a major factor in the emergence of diseases like H5N1 and H1N1 (bird and swine flu). Passing Issue 2 would be bad for animals—and bad for us. The other four reasons are good, too. Ah, capitalism run amuck! Big agribusiness is trying to take over an entire state by getting its citizens to legalize the worst aspects of factory farming. I don't live in Ohio, but if this referendum succeeds there, it will show up in other states.